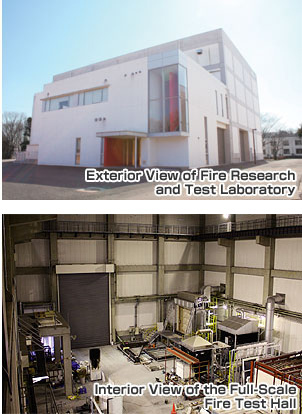 In March 2005, TUS opened the Fire Research and Test Laboratory, Center for Fire Science and Technology (hereinafter, CFSaT) as a research facility specializing in fire science that is equipped with world-class laboratories and equipment. CFSaT is located on the Noda campus. 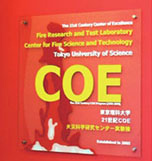 The CFSaT building area is approximately 1500 m2 with a total floor area of 1900 m2 and a ceiling height of 20 m. The members of CFSaT designed this research facility with its cutting-edge equipment based on their experiences, enabling world-leading research to be conducted here as a center of fire science. 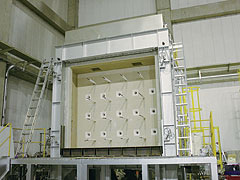 CFSaT is comprised of two major buildings, the Full-Scale Fire Test Hall and the Small Test Laboratories, according to their functionality. 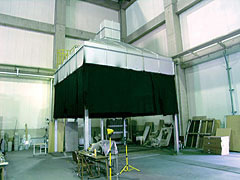 The Full-Scale Fire Test Hall is a large-scale laboratory with a floor area of 1000 m2 and a ceiling height of approximately 18 m. This building is adjustable to full-scale experiments that vary depending on such parameters as fire control or fire-proof performance of structural members and materials, burning behavior of combustible materials, and smoke movement. In order to provide practical education and research at the Center, as shown below, this building is equipped with devices and gauges that are capable of creating actual situations based on theory. The Full-Scale Fire Test Hall is also equipped with essential tools for fire research such as smoke-collecting hoods and fire-proof furnaces. 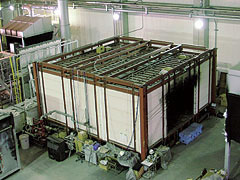 Utilizing the large-scale space, the building can be used for structural fireproof tests loaded with actual-scale structural members and frames, fire behavior tests of office spaces loaded with combustible furniture fittings and equipment, smoke behavior tests of an atrium space, and burning behavior tests of vehicles. The Small Test Laboratories are comprised of a multi-purpose experiment room, a cone calorimeter room, temperature and humidity controlled rooms, a library, an observation room, a data processing room, conference room, a precision measuring equipment room and a storage room. 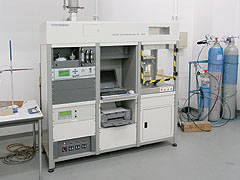 This device is used to examine ignitability and the exothermal properties of construction materials using thermal radiation. 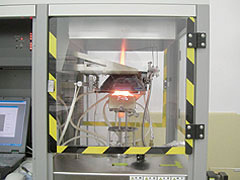 A test object is placed under the conical-shape electric heater which controls the thermal radiation to the object, and a pilot flame is applied to the object 10mm from its surface. The ignition time and the heat release rate can be measured per thermal radiation that can be set in the range of 0 to 50 kW/m2. This system measures the instantaneous velocity and/or microscopic flow rate of, for example, the combustion field and the smoke plume motion. With this system, in the case of using a tracer (microscopic particles) and light source such as strobe light and laser, a picture of the reflection can be taken by an ultrafast camera to instantaneously obtain two-dimensional data of the flow rate on the target field. The smoke ventilation (collection) fan at the hood vacuums up the combustible gas containing black smoke that is induced from a burning source, and this furnace re-heats the smoke to 800 to burn completely and then eliminates the smoke. There are 4 heating burners which can produce 4.8 Mkcal/h in total. This unit is used to evaluate the fireproof performance of various structural members such as columns, beams, floors and walls. The unit can control the heat to the standard heating temperature and furnace pressure set by ISO 834. The heating furnace, with dimensions of 1.5 m (W) x 1.5 m (D) x 1.5 m (H), can also provide immediate heating. This unit is used to evaluate the fireproof performance of an exterior wall under fire and can control the heat to the standard heating temperature and furnace pressure set by ISO 834. There are 20 burners on the lateral side, and this can heat up to a 3.5 m x 3.5 m area. 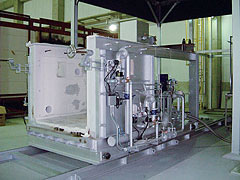 The unit is also suitable for performing heat tests. This unit is used to analyze the burning characteristics of furniture and equipment in a room by burning them and collecting the burning gas. The duct is equipped with devices for flow measurement and sampling. 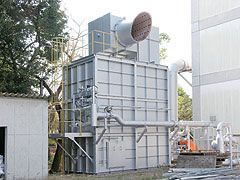 The design heat release rate is 2 MW at maximum, and the smoke suction power is 600 m3/min at maximum. A movable unit (4 m x 4 m) is also available. This fire compartment is 6 m (W) x 6 m (D) x 2.7 m (H) in actual size, and the sprinkler system can be attached to the ceiling. The compartment is mainly used to evaluate the fire extinguishing performance of sprinkler systems and also has used for experiments on smoke movement during sprinkler system activation. This unit is comprised of a space of 2.4 m (W) x 3.6 m (D) x 2.4 m (H) (approximately, the size of a 6-tatami-mat room) and an opening 0.8 m (W) x 2 m (H). It can be used to recreate a fire in a room with furniture and dry walls, which can be developed into a fully developed fire. In addition, flashover experiments can be performed with this unit by recreating fires that spread to entire rooms in a short time period, and then combustible gas concentration and temperature distribution data can be collected. 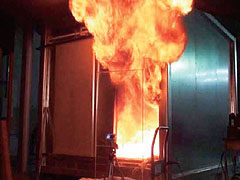 The development of the fire can be captured by video camera. This unit is designed to elucidate the burning behavior of combustible materials under the condition where a certain heat flux was given through radiative heat transfer. The unit can also be used to investigate the behavior of members exposed to radiative heat. 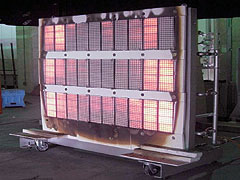 The panel heater has a heating area of 1.75 m (W) x 1.38 m (H). Members can be exposed experimentally to surface temperatures up to 950 and a heat flux of 50 kW/m2.